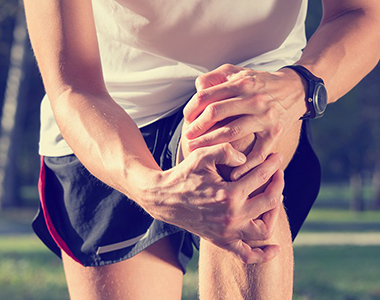 First and foremost, it is important to understand that knee pain is one of the most common musculoskeletal conditions that force people to visit an orthopedic specialist. It is common because the knee joint is particularly vulnerable to damage due to its function in taking the full body weight and force when running or jumping. When a patient’s knee becomes injured or diseased, the patient can experience severe pain that can greatly limit his/her ability to move or even walk. Knee pain can originate from any of the bones compromising the knee joint (femur, tibia and fibula), the kneecap (patella), or the meniscus (ligaments and cartilage of the knee). Overuse: osteoarthritis, patellar syndromes, tendinitis and bursitis. Call us toll free at 1-888-409-8006 or fill out the Appointment Request form. You don’t have to live with knee pain! We have offices in Hollywood, Plantation, Coral Springs, Deerfield Beach, Boca Raton and Stuart. Please consider that even light injuries can lead to serious complications if not treated or healed properly. The type of treatment determined by your orthopedic specialist will depend upon the severity and cause of your knee pain. When visiting any of our offices in Broward and Palm Beach to treat your knee pain, the first approach is always a moderate non-invasive option. Your knee specialist may prescribe medications to help with the inflammation and pain in the case of conditions such as gout or rheumatoid arthritis. Physical therapy may also be recommended in order to strengthen the muscles around the knee joint focusing in the quadriceps and/or hamstrings as well as a routine to improve balance. Your doctor may also recommend knee injections that go directly into the knee joint. The medications injected usually contain corticosteroids (potent anti-inflammatory), hyaluronic acid (to lubricate the knee joint and to improve overall mobility), and/or platelet-rich-plasma or PRP (contains different growth factors that help in reducing inflammation and to promote natural healing). If moderate treatment doesn’t yield results and/or the condition or knee injury is too severe, you may require a knee surgery. Regarding knee surgery, the options available nowadays vary from minimally invasive knee surgery to a total surgical joint reconstruction. Among the knee surgical options, the most common is knee arthroscopy, partial knee replacement, total knee joint replacement.